Lifelike sound for all your music, including wireless music. Bose Wave SoundTouch. There’s a world of music out there. This compact system lets you easily enjoy all of it. Use it to stream millions of songs from music services such as Spotify and Deezer, thousands of Internet radio stations and the music stored on your smartphone, tablet or computer. There’s also a CD player and DAB /AM/FM radio tuner. So you can hear whatever you want with room-filling Wave sound all from an easy-to-use system with a fresh, updated design. The Wave SoundTouch system features the legendary performance of the award-winning Wave music system. An exclusive Bose innovation waveguide speaker technology delivers the deep, rich sound of larger and more expensive stereos. With SoundTouch , you can discover and enjoy music more effortlessly than ever before. Wirelessly stream millions of songs through Spotify and Deezer, as well as Internet radio stations and your own music library. A powerful app lets you control your music from anywhere in the house with your phone or tablet. And six easily programmable presets let you play your favourite music from the app or the included credit card-style remote. The Wave SoundTouch music system is also part of an entire family of wireless products, from one-piece music systems to home theater. They all work together to play the same music in every room, or different music in different rooms. The Wave SoundTouch system sets up easily in minutes. The app helps walk you through the steps. Regular or home-burned CDs/MP3 CDs load directly into the front, and your streaming music sources and AM/FM stations are available at the touch of a preset. A slim infrared remote control lets you operate all system functions from anywhere in the room, and the convenient touch-top controls for on/off/snooze are completely invisible. You hear your music with clear, full, accurate sound. All from a music system that fits virtually anywhere: living room end table, kitchen counter or bedroom nightstand. Bose Corporation 2015. All rights reserved. 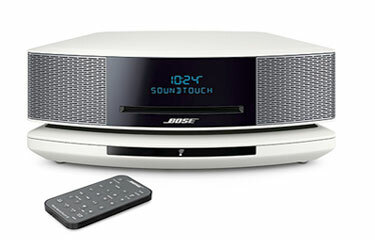 Offer available when purchased by phoning 1800 663 099, via www.bose.com.au or from a Bose store. Offer valid from 1st November to 31st December 2015, or whilst stocks last. Offer cannot be applied to previous purchases. If the product is returned then the free Black SoundLink Colour must also be returned to qualify for full refund. Risk-free trial refers to home trial only. The Bluetooth word mark and logos are registered trademarks owned by Bluetooth SIG, Inc., and any such use by Bose Corporation is under license. Deezer is a registered trademark of Blogmusik SAS. Spotify is a registered trademark of Spotify AB. Wave music system is a registered trademark of Bose Corporation in the US and other countries. SoundTouch is a registered trademark of Bose Corporation in the U.S. and other countries. Wi-Fi is a registered trademark of Wi-Fi Alliance . A home Wi-Fi network and Internet access are required. Available in Espresso Black or Platinum Silver.